MEASURES 59-in x 54-IN - This supersized order of fries is 59-in x 54-in when fully inflated. It’s a good size for floating and relaxing in the pool with your favorite beverage in hand. 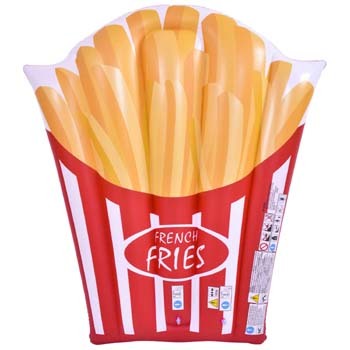 NOVELTY GOURMET FRENCH FRY DESIGN - This pool float is designed to resemble an order of fries in a red and white striped cup. It even has the words “french fries" scrawled across the front. EASY TO INFLATE - These gourmet fries deflate easily for storage or travel. Once you’re ready, quickly inflate it for a relaxing time at the pool or lake. FOODIE FUN - The unique design is quirky and fun. Have a blast at your next pool party with a novelty floating food. Kids and adults will have a blast lounging, splashing and floating on this blow-up raft.